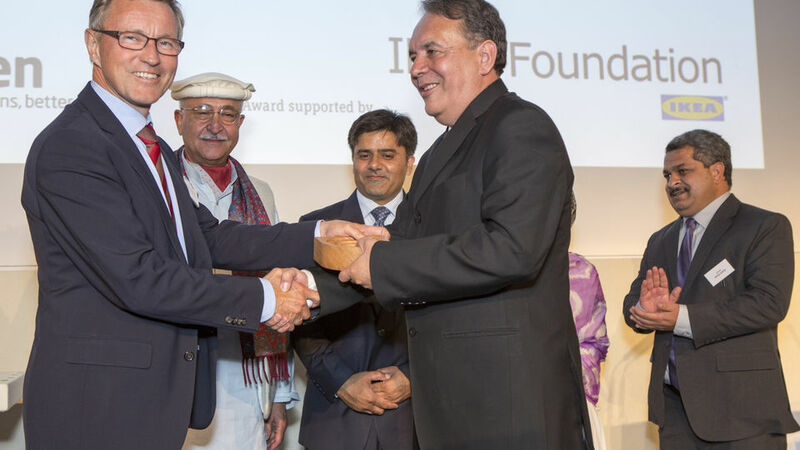 Masood Ul Mulk of SRSP receiving its award from Per Heggenes of the IKEA Foundation. 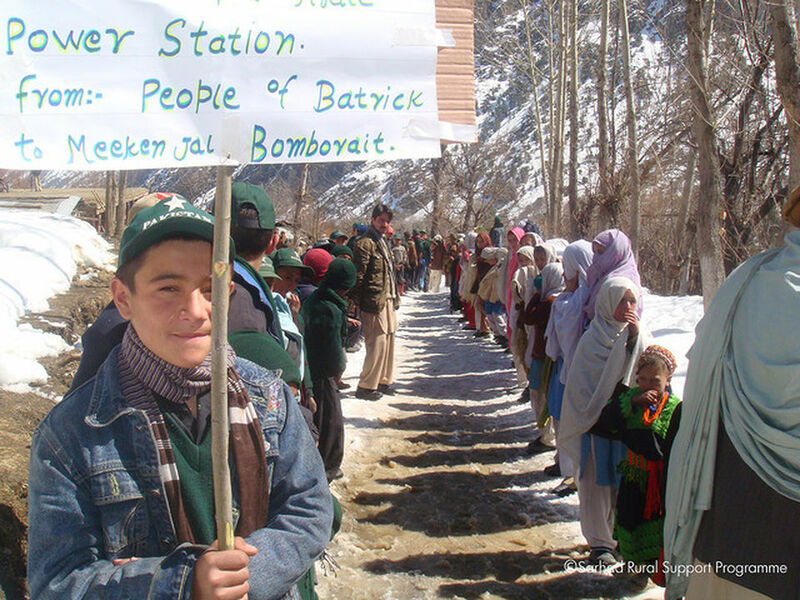 It’s a huge challenge to provide mains electricity to regions like the North-West of Pakistan: isolated, often cut off by snow or earthquakes and plagued by political instability. With no mains electricity in many villages, life stops after sunset. But the area does have an abundance of water. Since 2004, SRSP has built 189 micro-hydro schemes, bringing electricity to around 365,000 people, transforming communities. Electricity makes studying easier, health care safer and it allows new businesses to start. 365,000 people now with access to electricity. 51,000 households now with electricity. SRSP has shown the wonderful chain reaction that results from access to electricity. Its micro-hydro plants enable businesses to thrive, health clinics to operate fully and bring 21st century communications and education facilities to one of the most challenging parts of Asia. The Khyber Pakhtunkhwa region of Northern Pakistan, close to the Afghanistan border, is one of the most remote and challenging areas of the world to live. With no mains electricity in many villages, life grinds to a halt after sunset. But something the mountainous area does have in abundance is water. Since 2004, local NGO the Sarhad Rural Support Programme has built 189 micro-hydro schemes, bringing electricity to around 365,000 people and transforming communities in the process. 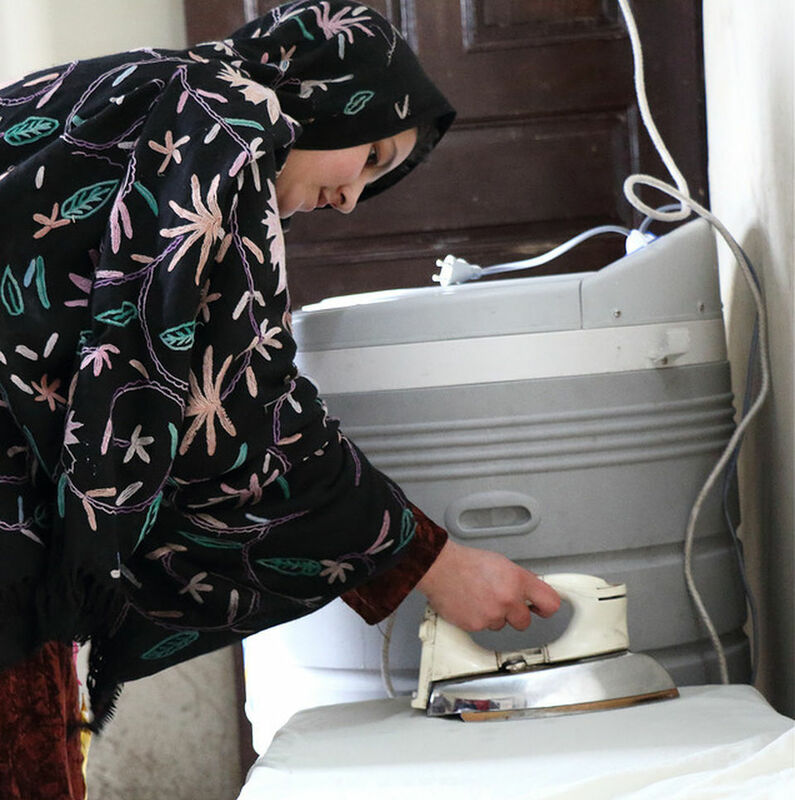 Electricity makes studying easier and health care safer, while appliances like washing machines reduce the drudgery of housework for women. And access to power enables a multitude of new businesses to start up, from flour mills to hotels. 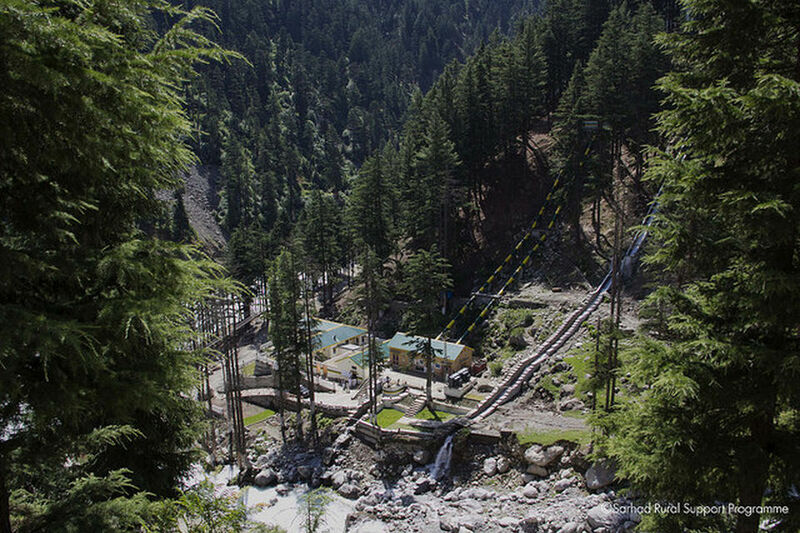 Micro-hydro power is bringing energy to remote communities in north Pakistan. Since 2004, SRSP has installed 189 micro-hydro schemes with a total capacity of 15 MW, bringing power to about 365,000 people. 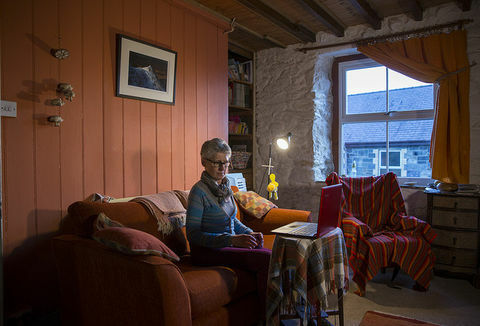 Electric light makes homes more pleasant, study easier, and health care safer. Electric light makes homes more pleasant, study easier, and health care safer. Appliances like washing machines cut down the drudgery of housework for women. Phones, TV and internet provide access to new skills and a window on the world, reducing isolation. SRSP micro-hydro schemes employ around 570 people, and electricity has enabled income generation for many more. Some employment, like baking and flour milling, caters mainly for the local market, but fruit-drying, craft work and hotels also bring in much-needed income from elsewhere. With support from SRSP, women in some parts of the region are earning an income for the first time. Since 2004, SRSP has installed 189 hydro systems with total capacity 15 MW. These have brought power to over 51,000 households with about 365,000 family members in total, as well as to a wide range of community facilities and businesses. For about 90% of households, an SRSP hydro scheme provides the first ever access to electricity. For about 90% of households, an SRSP hydro scheme provides the first ever access to electricity, and it has huge impact on lives. An immediate change is electric light, replacing dim and dirty kerosene lamps and pine-torches. This brings many benefits. Domestic work is easier and income-generating work, like embroidery, can be done in the evening. Children study better with electric light and parents can read and teach their children to read too. Teachers note that electric light improves both performance and attendance because children have completed their homework and so aren’t afraid to go to school. Electric light also makes it safer to be outdoors at night. This, like many of the benefits of light, is particularly valued by women and children. Labour-saving appliances like washing machines and electric butter churners cut the drudgery of housework for women. Wood-burning stoves and heaters can be replaced with cleaner, quicker, electric versions. With power for phone-charging in the home (and to run phone masts and telephone exchanges), families can keep in touch. Access to radio, TV and internet all provide a window on the wider world and reduce the isolation of the region. Again, this is particularly valued by women, who are more restricted than men in mixing outside the home. Now there is light the children ... are happier coming to school because they have done their homework and they have clean, pressed uniforms...I see a big change in them, they’re more informed, more knowledgeable. Electricity greatly improves community services. Health centres and hospitals have good quality lighting for examinations and procedures, and can also run pathology tests and refrigerate vaccines. Schools with good lighting and computers can teach better and broaden their curriculum. In some villages, IT centres have been set up, providing both access and training on computers and the internet. Woman ironing, Kalam, Swat Valley. SRSP notes that communities often ‘gel’ through working together on a hydro scheme. Once the scheme is in use, people say there is less pressure to leave their home village because of the better services that become available. The micro-hydro schemes provide direct employment and income to about 570 operators. And the reliable electricity that they generate has helped expand businesses and income-generating opportunities in the region. Some businesses cater mainly to the local market, like bakers, tailors, beauty parlours and flour mills. Others bring in much needed income from elsewhere. Tourists from other parts of Pakistan are starting to come back to the region, encouraged by hotels with reliable electricity for lighting and services. Drying fruit like persimmon in electric driers produces a better-quality product that can be sold elsewhere. Olives, which grow wild in the region, can now be processed for sale. Before the hydro, when clothes needed washing, we had to go to the river. We’d be there all day, from 10 till 4, every few days. Now it just takes two hours. Traditions are changing and, with support from SRSP, women in some parts of the region are starting to earn income, helped by electricity. Fruit drying, baking and beauty parlours are all business which involve women. Income generation at home also plays a part, through embroidery and other crafts which can now be done after dark. Some educated girls make the most of electric lighting by offering home tuition in the evening. For many women, this is the first income that they earn. Their first priority in using it is usually to invest in their children, through schooling and school clothes for young children, and financial support for adult children in businesses and other ventures. Usually sons have first priority, but extra money means that daughters will also get opportunities. Clothing and jewellery are also popular purchases with any money left over. 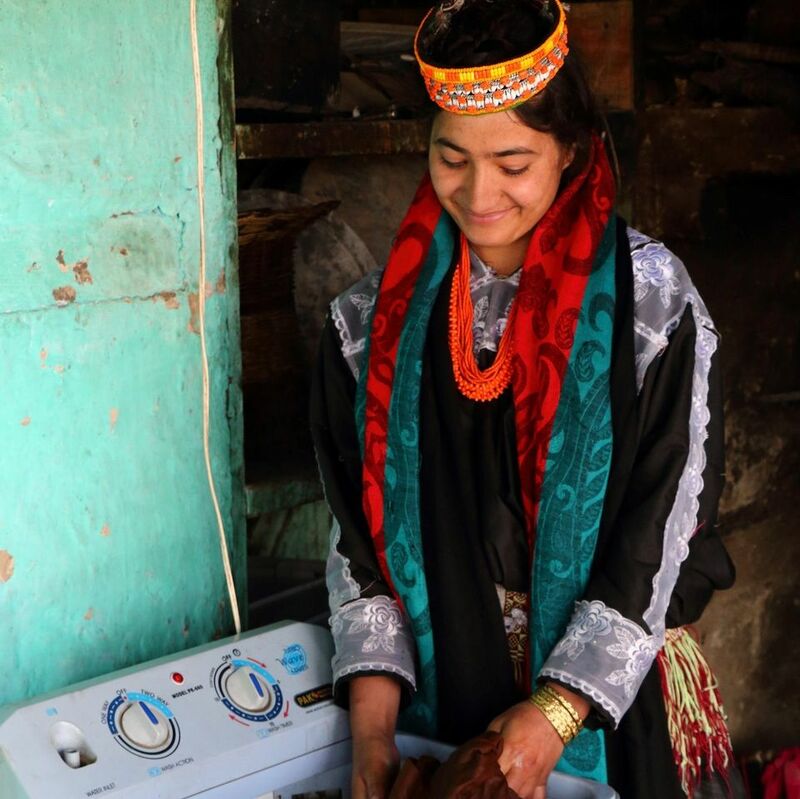 Kalash woman with washing machine. Electricity from hydro schemes cuts down the use of wood for cooking, heating and lighting (used in the form of pine torches). This helps reduce deforestation which is a huge problem in the region. The hydro schemes also cut greenhouse gas emissions, by virtually eliminating the use of kerosene lighting, cutting the use of diesel generators, and reducing the use of unsustainable wood. 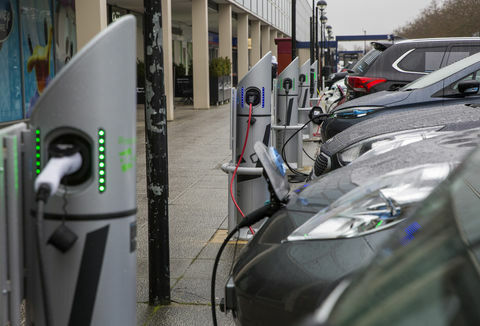 A detailed breakdown has not been made of fuels replaced, but an indication of the significance can be made by assuming that the estimated 110,000 MWh of electricity generated each year replaces diesel generation producing around 0.8 tonnes CO2 per MWh. This suggests a substantial greenhouse gas saving of around 88,000 tonnes of CO2 per year. SRSP has shown that it is possible to bring the huge benefits of electricity to really challenging parts of Pakistan through micro-hydro schemes. SRSP has shown that it is possible to bring the huge benefits of electricity to really challenging parts of Pakistan through micro-hydro schemes. Through active engagement with many community organisations, SRSP has set up the structures needed to keep the schemes in operation and to share the benefits widely. This proven success had secured further funding, mainly from the EU and the Government of Pakistan, for a significant expansion of the programme during 2015 and 2016. Funding for an additional 238 schemes will bring the total to 33 MW of micro-hydro capacity in 427 schemes, providing electricity to about 760,000 people. Total SRSP hydro plants in use at the end of the year has increased 39%. Total capacity of kW has increased 41%. Total households served by off-grid has increased 85%. The total tonnes of CO2 emissions saved has increased 41%. The Award to SRSP highlights its success in working with remote communities to provide the lifechanging benefits of access to electricity. SRSP carries out its development work through a large, linked network of local organisations (see box), and it is these organisations that identify a need for hydropower in their community. If the location appears suitable, then SRHP staff carry out a social feasibility study, which includes assessing demand and ability to pay for electricity and identifying new business opportunities that electricity could bring. They also make a technical feasibility study. If the scheme is approved and funded, then SRSP starts detailed discussions with the local organisations and community leaders on issues such as water rights and land ownership. With guidance from SRSP, the community forms a Power Committee to oversee the scheme. This Committee is responsible for managing and maintaining the plant – including appointing the paid operation and maintenance staff, setting tariffs and managing the income from the scheme. In parallel, SRSP technical staff make a detailed survey of the site and from this design and build the hydro scheme. The community provides some of the labour for this. Initially, SRSP owns the plant and oversees the operation, including maintenance and servicing. But within a year (for small plants) or up to six years (for large plants) legal ownership is transferred to a local organisation. The Power Committee remains responsible for management and maintenance. Because SRSP works long-term with communities, it is always around to provide support. It is like dawn breaking after a long gloomy night and the first rays of sun shining on white mountain peaks, to hear that we have been selected for an Ashden Award for making electricity accessible to communities whose life, already overwhelmed by isolation, had been made more miserable by floods, war and terrorism. How do the hydro-power schemes work? 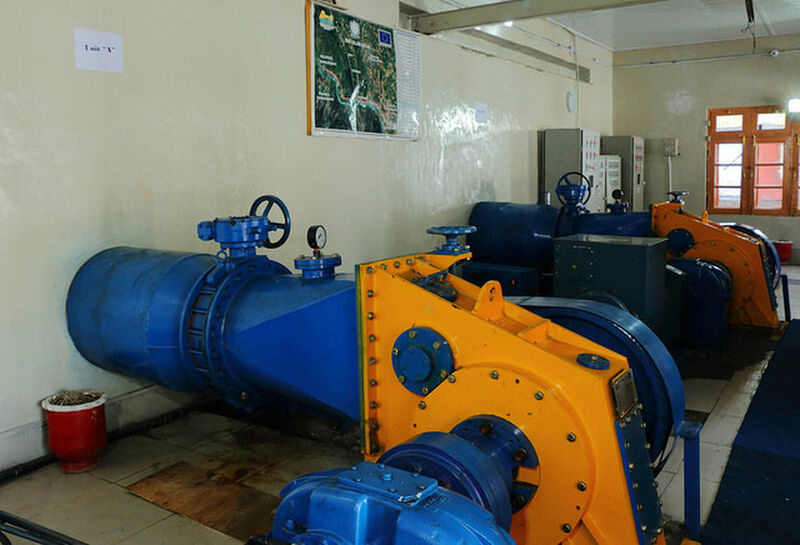 SRSP’s micro-hydro schemes use falling water, diverted from a stream or small river, to turn a turbine which is located in an earthquake-proof power house. The turbine rotates a shaft, which drives an electrical generator. Electricity is distributed through overhead lines with connections to individual customers. Each customer has a circuit breaker to set the maximum power that can be drawn and a digital kWh meter to measure total electricity consumption. The hydro plants run continually, except during maintenance. The local operators have a daily and monthly maintenance schedule to follow, including greasing bearings, keeping channels free from debris, and removing snow from power lines. The total cost of installing a hydro scheme, including cabling, has averaged US$1,300 per kW, but varies significantly depending on the location and complexity of the site. This cost is covered by donor or Government grants. 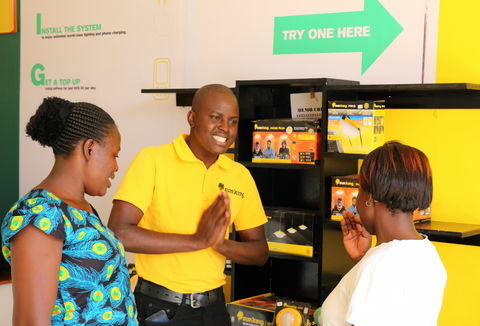 Each customer has an electricity contract with the Power Committee, and pays a connection fee of around US$20 and then a monthly fee for the kWh of electricity used. The local Power Committee sets the tariff, with advice from SRSP. A typical domestic rate would be around US$0.04 per kWh, with an allocation of about 60 kWh per month. The operation and management staff are responsible for collecting payments. Our valley is so beautiful, who would want to leave it now we have electricity?